A NEW 60-tonne mega truck has been road-tested in Spain. 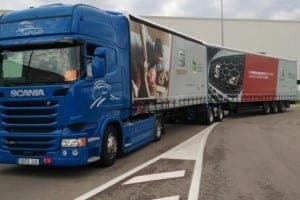 The truck – all 25 metres of it – was unveiled by SEAT and Group Sese last week, near the carmaker’s main factory in Catalunya. Mega trucks were approved by the Spanish government in December 2015 and could slash road transport costs by an estimated 22%. “The lorry will increase capacity, reduce the amount of lorries in circulation and cut emissions by 14%,” said Group Sese director, Federico Ballester.